The expanding remains of a supernova explosion in the Milky Way are shown in this composite image, on the left, of the supernova remnant G1.9+0.3. NASA's Chandra X-ray Observatory image obtained in early 2007 is shown in orange and the radio image from NRAO's Very Large Array (VLA) from 1985 is in blue. The difference in size between the two images gives clear evidence for expansion, allowing the time since the original supernova explosion (about 140 years) to be estimated. On the right is an infrared image from the Two Micron All Sky survey (2MASS), where the colors represent different infrared wavelengths. The center of the galaxy is the bright red spot in the upper right and the location of G1.9+0.3 is shown by the box in the lower left, less than two degrees away (corresponding to about a thousand light years at the distance of the galactic center). More stars are visible in this 2MASS image than in an optical image, where obscuration by dust and gas is more prominent. Also, note the difference in orientation: in the close-up view of G1.9+0.3, north is up and east is to the left, while in the 2MASS image north is to the left and east is down. Credit: X-ray (NASA/CXC/NCSU/S. Reynolds et al. ); radio (NSF/NRAO/VLA/Cambridge/D. Green et al.). 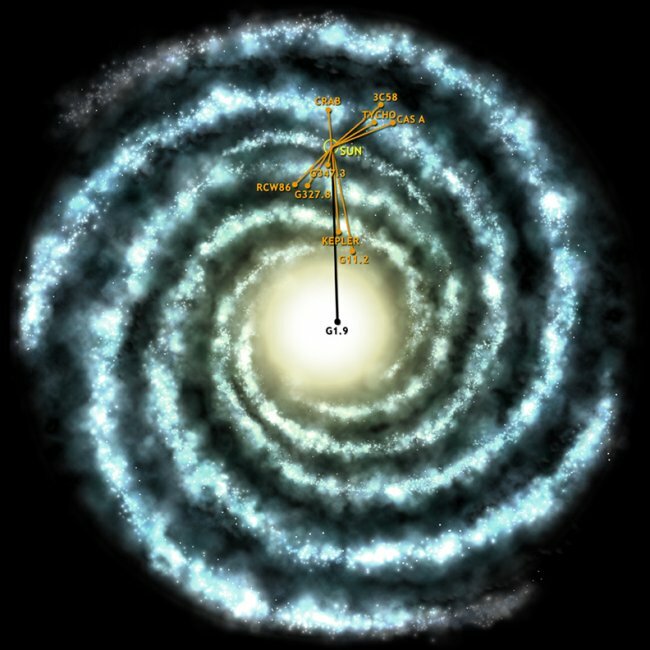 Location in the Milky Way of historic supernovas. This artist's impression shows a view looking down on the Milky Way galaxy. The position of the Sun is shown, as are the approximate positions and names (shown in orange) of historical supernovas. These are stellar explosions that are thought to have occurred in the last 2,000 years and may have been seen by early astronomers. The estimated position of the recently discovered G1.9+0.3 is shown in black. Although the distance to this remnant is uncertain, the angle is accurately known. Note that G1.9+0.3 is the only object that is found in the bulge of the galaxy. Credit: NASA/CXC/M. Weiss. G1.9+0.3 is the youngest known supernova remnant in the Milky Way Galaxy with an age, since its explosion as a supernova, of only 140 years. This easily beats the previous record of about 330 years for Cassiopeia A.